This study addressed differences between Diplocardia spp. 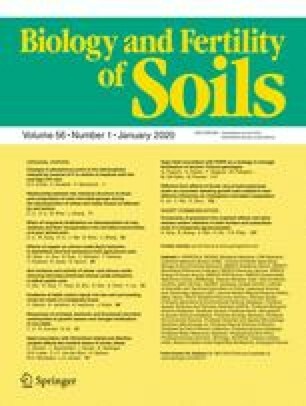 (a native North American earthworm) and Octolasion tyrtaeum (an introduced European species), with respect to behavior, influence on soil microbial biomass, and plant uptake of N in tallgrass prairie soils. We manipulated earthworms in PVC-encased soil cores (20 cm diameter) over a 45-day period under field conditions. Treatments included: (1) control with no earthworms, (2) Diplocardia spp. only, and (3) O. tyrtaeum only. Prior to addition of earthworms, seedlings of Andropogon gerardii (a dominant tallgrass) were established in each core, and a dilute solution of 13C-labeled glucose and 15N-labeled (NH4)2SO4 was added to the soil to facilitate examination of earthworm/microbe/plant interactions. We found that Diplocardia spp. were significantly more active than O. tyrtaeum, and quickly assimilated 13C and 15N from the tracer. Individuals of Diplocardia spp. were present at shallower soil depths than O. tyrtaeum throughout the study. Contrary to expectation, this greater activity of Diplocardia spp. did not result in increased plant productivity. Rather, the activity of Diplocardia spp. was associated with less plant growth and smaller amounts of N acquired by A. gerardii seedlings compared to controls or O. tyrtaeum treatments. We observed few significant influences of earthworm treatments on microbial biomass C or N pool sizes, but the microbial C/N ratio was consistently greater in the presence of Diplocardia spp. relative to O. tyrtaeum. Results of this study indicate that activity of earthworms may enhance competition for N between microbes and plants during the growing season in tallgrass prairie.